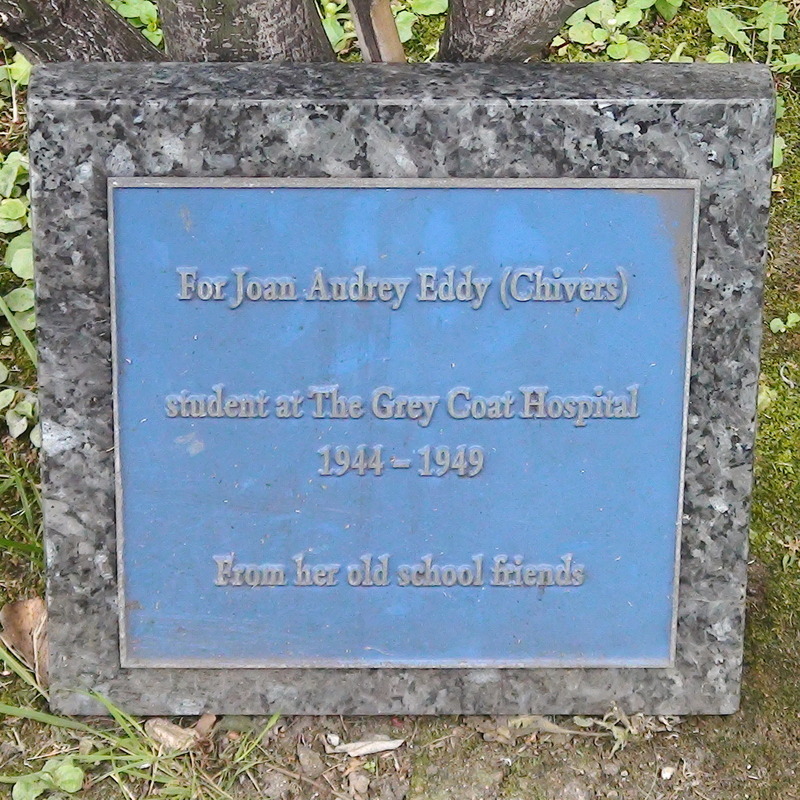 For Joan Audrey Eddy (Chivers), student at The Grey Coat Hospital, 1944 - 1949, from her old school friends. The scholars are on the central facade of the building: boy to left, girl to right, with the British Royal coat of arms between. 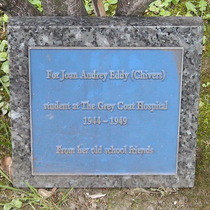 Above them is the text "Grey Coat Hospital 1698 - 1955". 1698 is the school's foundation year but we cannot explain the 1955. Then, in 2017, Margaret Meadows, a pupil at the time, kindly wrote to tell us: "1955 was the year that part of the building was reopened by Princess Alexandra after being bombed during WW2." The trees with the blue plaques are in the garden facing the road, to the right of the Thompson plaque: Eddy on the left, Rusbridge on the right. Plaque unveiled by Ray Mears. Erected sometime before May 2015. To our dearest Tim Godwin, 1964 - 1995, with lots of love, Mum, Dad & Nic. LYH.